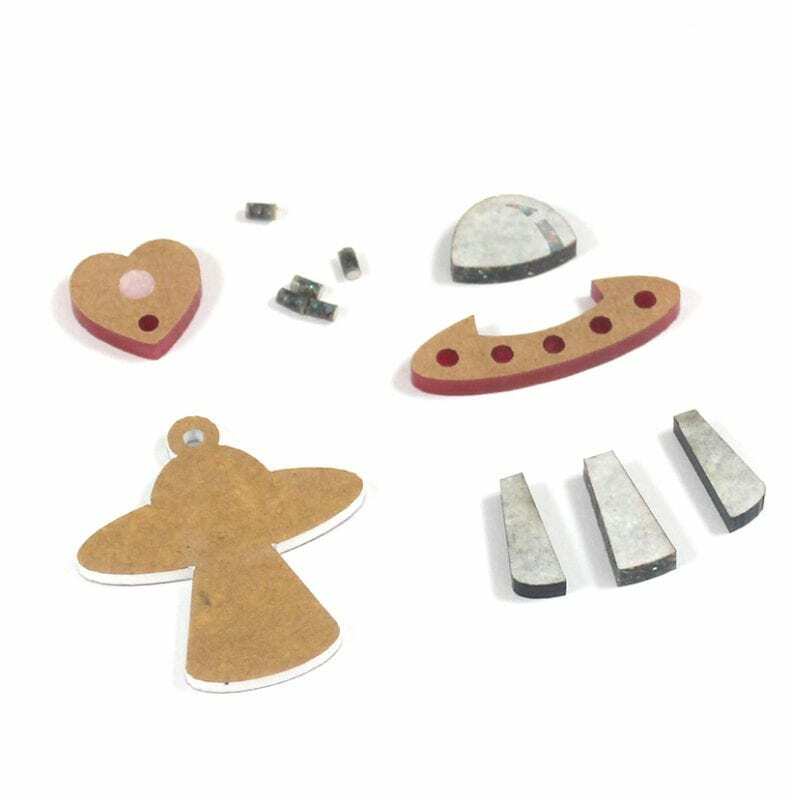 A step-by-step sample process of how to make the very-much-in-fashion multi-piece laser cut jewellery items (such as brooches and earrings), which are made with different pieces that are glued together like a small puzzle (usually onto a backing layer). This is peak complexity, and also the best option for getting super creative and bringing to life complex and unique ideas! The first step is to visualise what you would like to make! 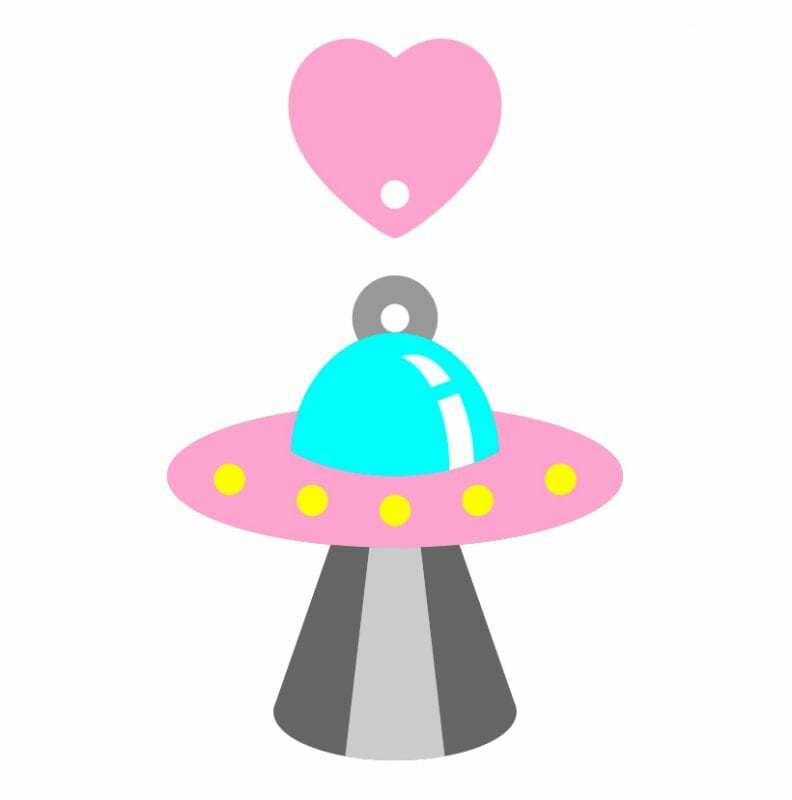 You can create your design yourself, purchase the rights for use for a design, or commission a designer or illustrator to visualise it for you. Need help? We recommend some great designers and resources here. With your design visualised, consider how it will break down to be made as laser cut and engraved shapes. Think about any holes or loops that you may need. Check that nothing is going to be too small or thin e.g. 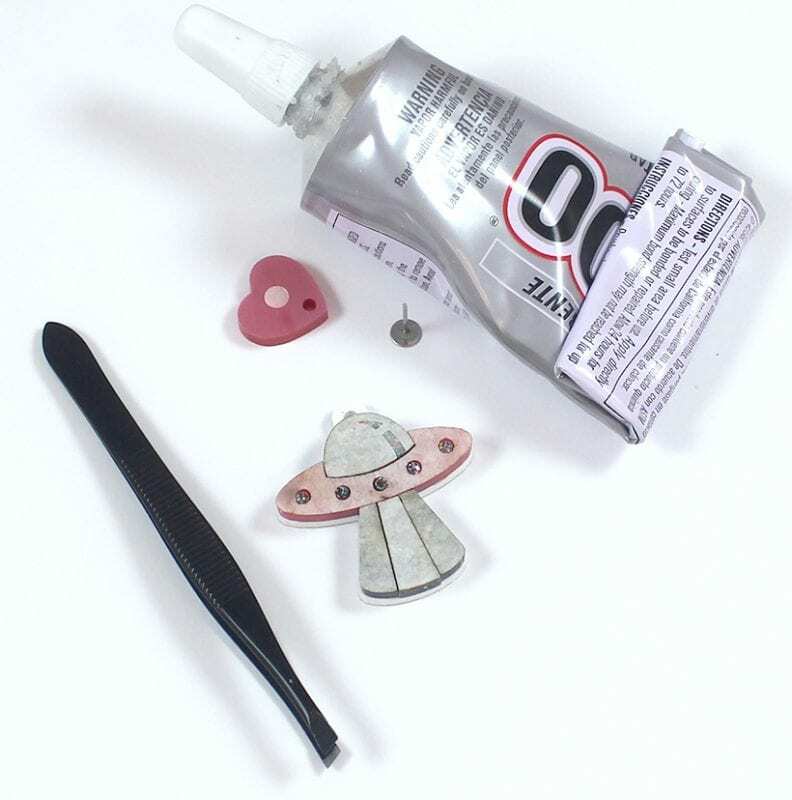 the small circles on this UFO sample are only about 3mm, they were tiny to handle and glue! 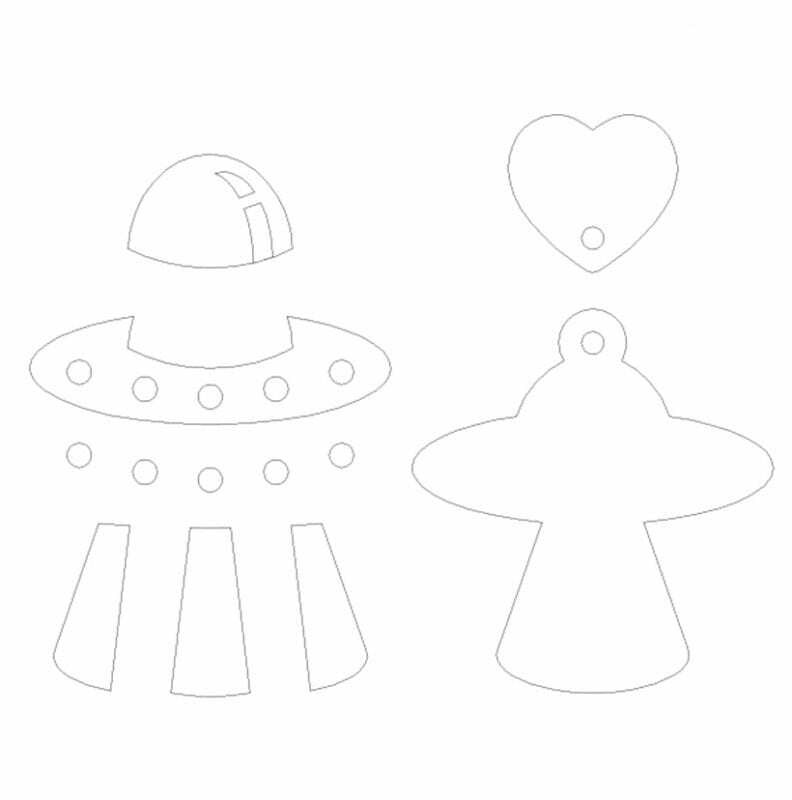 With your shapes decided and finalised, you need to convert them to be vector shapes (if they aren’t already). If you do not know how to create a vectors, this is where you could hire a graphic designer. A vector file is not made of pixels (like most images on a computer screen). Vectors are made by ‘points’ and ‘paths’ determined by mathematical formulas. 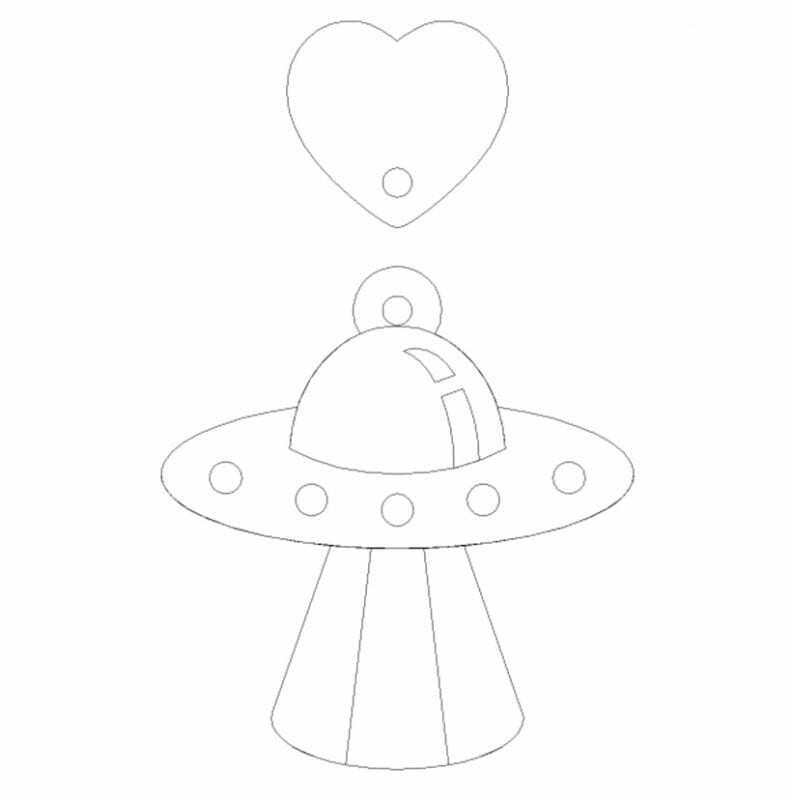 The easiest way to tell if your shape is a vector is to zoom in as far as you can – vector shapes will always be a smooth path when zoomed in (i.e. not pixelised). 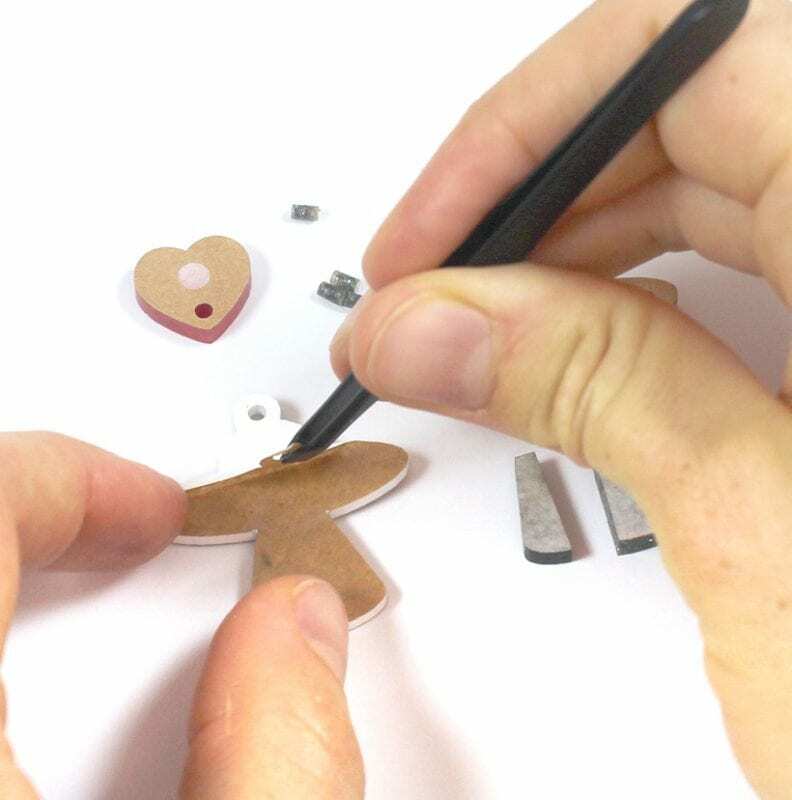 The laser cutter is so precise that you want your digital vector shapes fit together perfectly, just as you would like them to be in real life. 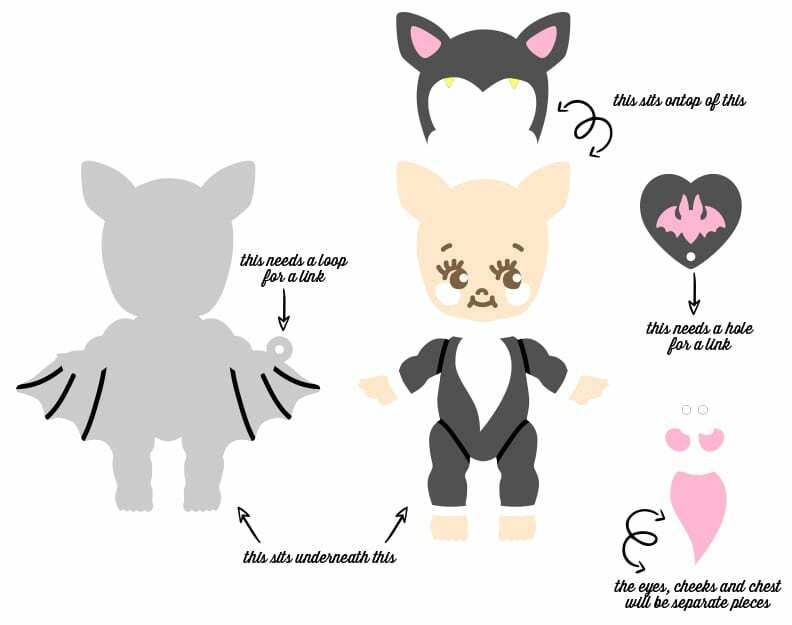 Print out your design at the size that it will actually be and see how it looks. It’s difficult to gauge how images on a screen will look when they’re engraved/laser cut and printing your design out on your home printer is by far the best test to get an idea of how it will look. You might find that your design is too detailed and needs to be larger, or that some parts are too fine and need to be thicker, or it might be just perfect! Either way, if you can be pleased with how your design is looking at this stage, you’re going to love how they are laser cut! For any lines that you want to be cut, give them a RED (255, 0, 0) 0.1pt stroke. 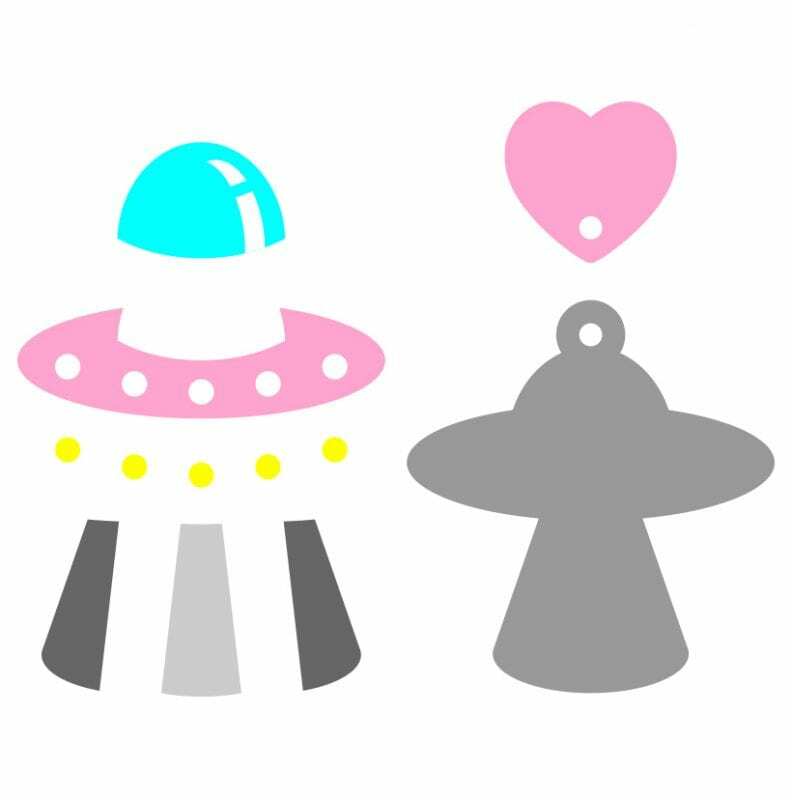 For any areas that you want etched, give them a BLACK (0, 0, 0) FILL. 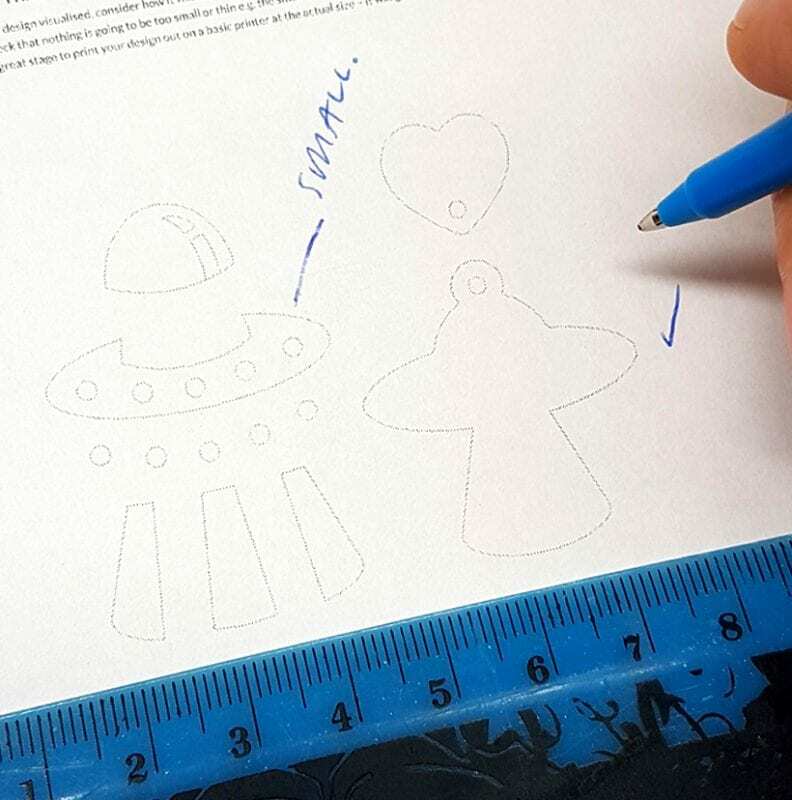 For any thin lines that you want done with line engraving, give them a BLUE (0, 0, 255) 0.1pt stroke. The laser cutter can ONLY read these colours and line widths, so any variation to these guides won’t work (such as a red (255, 20, 20) colour or 1pt stroke) – the laser just won’t understand! For more detailed hints and tips about setting up your Guides for Quote by File (Vector File). 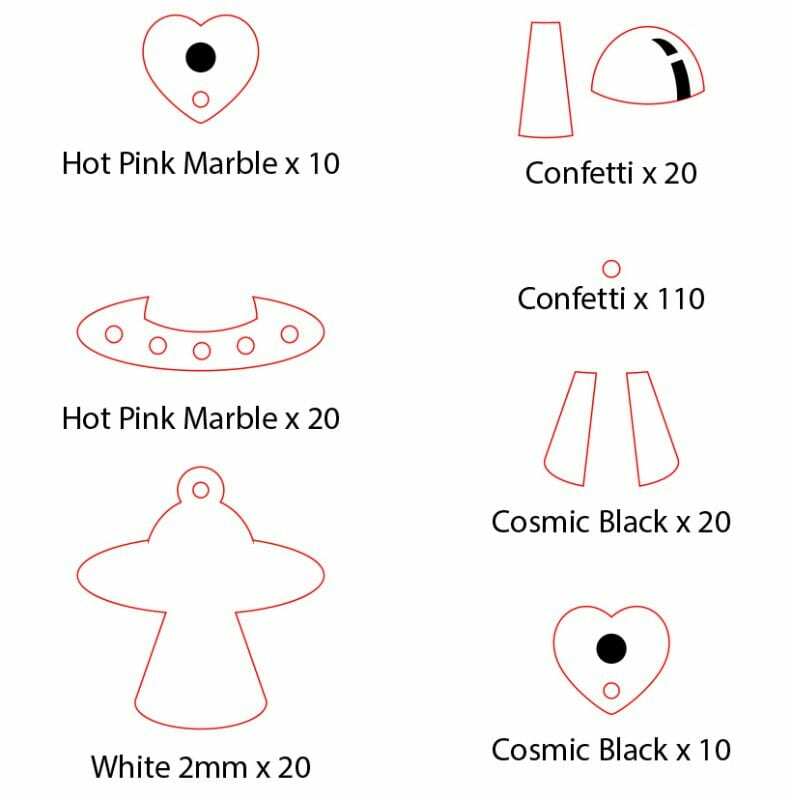 Pick your material types and colours from our material gallery and decide how many of each shape you need for each material. Keep in mind, you’ll pay an operator fee for each different material, so it can be cost effective for small quantities to limit your material range. It’s a also a really good idea to order yourself extras of small (<5mm) pieces, just in case you drop one! 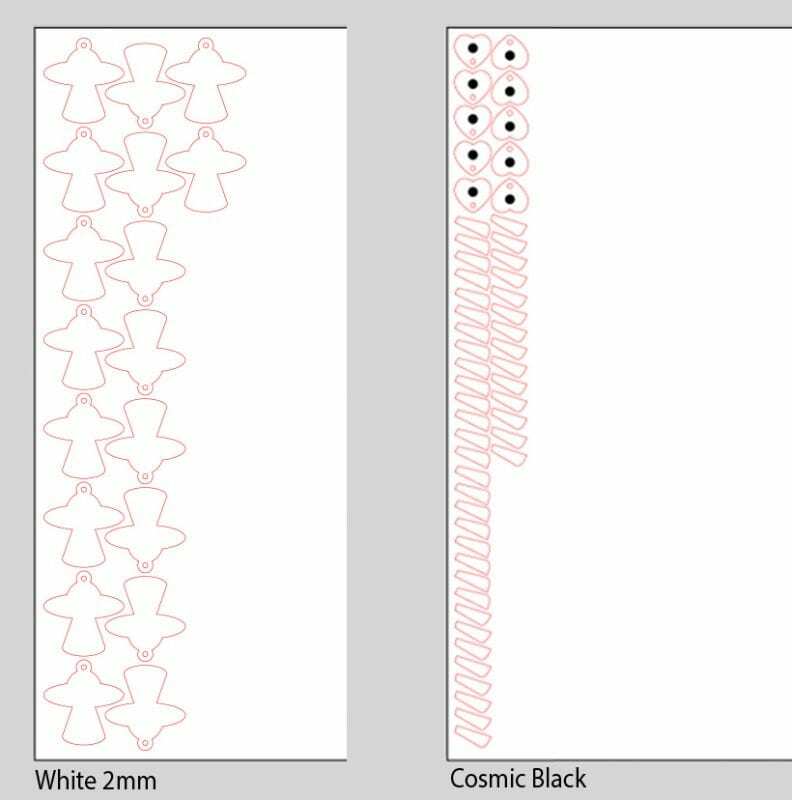 Now that you know how many of each shape you want, and what material you want them in, it’s time to arrange your material sheets. Follow the material size for the material that you would like (you’ll find this information in each material gallery listing), and leave around 3mm in from each edge, and 1-2mm between each shape. Work in columns, from top to bottom, left to right. Arrange any etched designs together. If you do not know how to use computer programs that can create vector shapes, this may also be a good job to hire a graphic designer for. Vector Etch does not offer a service to lay out material sheets. For more detailed hints and tips about setting up your Guides for Quote by File (Vector File). 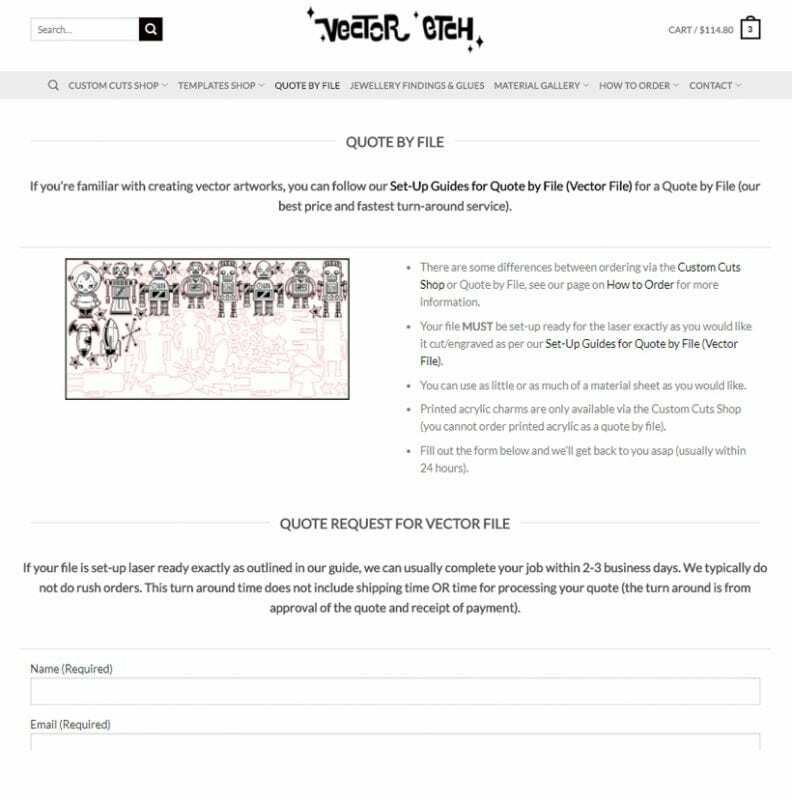 With your files finalised, you can now submit them to Vector Etch for a Quote by File. This is the only stage that we can create a quote from – we send the file to the laser, and it tells us how long it will take. It’s different for every file e.g. a sheet of circles would cut faster than a stars, because the laser will take longer to travel the distance around each star. Different types of materials can effect price also e.g. a sheet of kaleidoscope acrylic is quite dense and requires a high power laser setting to cut through it when compared to something that is less dense, like 2mm white acrylic. So, the price always depends on what’s in your finalised file. We’ll send your file/s to the laser to see how long they will take to be cut, and invoice accordingly. We’ll send you a link to view your quote, and on receipt of payment we’ll add your files to our queue to be processed asap. When your order is ready, we’ll send you an email to let you know. Depending on what you requested, your order will be posted (Express or regular) or you may communicate a time with us that you will come to pick it up from our studio in Yeerongpilly. 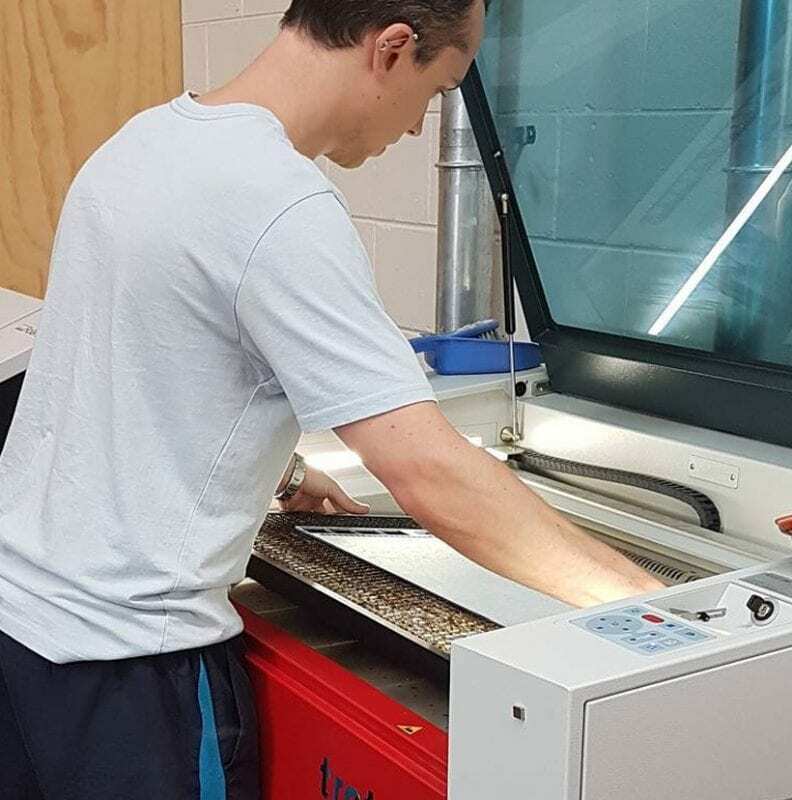 Most materials that are laser cut come with a protective tape that will need to be peeled off to reveal the material underneath. The tape protects that material from any marks or scratches during processing. To peel, gently pull at an edge with a pair of tweezers. The trick is to go slow and pull the tape off in one slow motion. Tip: Leave tape on the surfaces that don’t need gluing until you’ve finished assembling. Squeeze some E6000 (about the size of a pea) out onto your piece of card. Use a match stick to apply glue to small parts. Continue to glue all parts down into place. Apply light pressure to make sure that the pieces are glued securely. Squeeze out more glue as needed. Keep your piece of card as a way to double check when your glue is set. Now that all the pieces are glued down, double check that they are all aligned neatly in their final right position. Make sure the backing layer lines up with the edges of the top layer. Leave the pieces for at least an hour so that they won’t wiggle around during assebmly. While the protective tape is still on, finish up assembly that’s desired for your design. Here we glued an ear post on the back and linked the top and bottom charms together. Step 15: The Final Result! Peel off the last of the protective and marvel at your stunning laser cut creation! Make the most of your hard work setting up and laying out a vector file by re-ordering the same design in different materials. 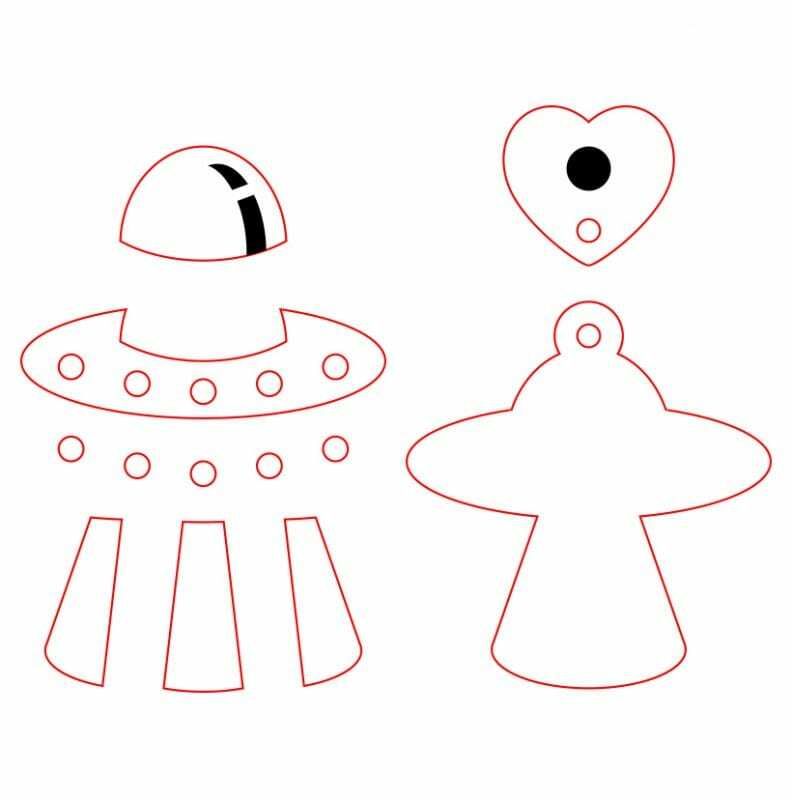 Vector shapes can be scaled up and down – play around with making larger (or smaller, if the design allows) variations of your design to make different end products like brooches, statement pendants, wall art, etc. If your design is particularly complicated (such as lots of intricate pieces need to fit together), consider ordering it first all in clear acrylic or white acyrlic. Clear acrylic is our cheapest material, but will still have all the qualities (surface finish, thickness, etc) as other acrylics to good a great test with. You’ll save money on operator costs only using one type of material.